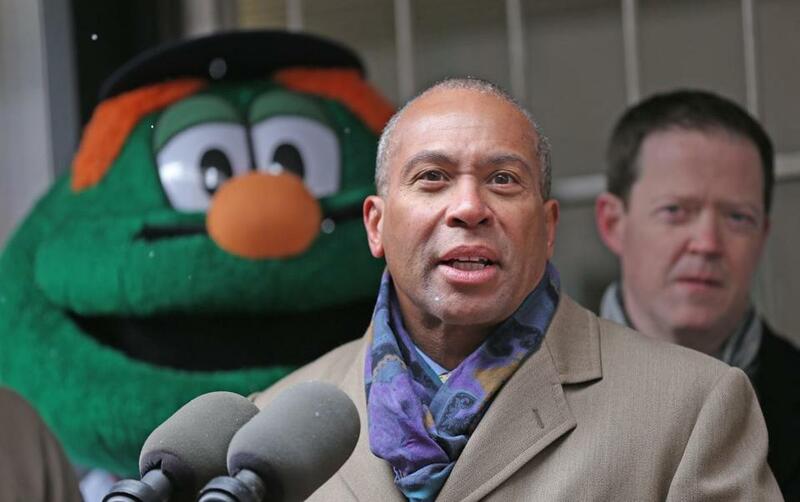 The local Olympic bid committee, Boston 2024, would have paid former governor Deval Patrick (pictured) $7,500 a day for travel on behalf of the city’s bid. Former governor Deval Patrick says he will soon take his first full-time position since leaving office in January, and will forgo the $7,500 daily fee he was to be paid for occasional travel on behalf of the local Olympic bid committee, Boston 2024. Patrick’s announcement came a week after his rate of pay made headlines and several hours after Mayor Martin J. Walsh said he did not think the former governor should be paid for private work as a globetrotting ambassador for Boston’s Olympic bid. “Because I think the Olympics could be good for the Commonwealth, I will continue to help as and when I can, but not for a fee,” Patrick said in a statement. Walsh, who had pressured Boston 2024 to disclose Patrick’s fee shortly after the committee confirmed it had hired the former governor, said he believed Patrick would make an excellent ambassador for Boston but that the fee could send the wrong message. “I just think it adds more credibility to it when they are volunteer ambassadors,” said Walsh, a passionate backer of the Olympic bid. The public debate about Patrick’s compensation was the latest distraction for a bid committee that has had a difficult winter: Record-setting snowfall that overwhelmed the MBTA, a system on which the Boston Olympic bid heavily depends, contributed to the perception that the city is not up to an international festival, even one in the summer. A WBUR poll released Thursday evening suggests 36 percent of Boston-area voters support bringing the Summer Games to Boston nine years from now, down from 44 percent in a poll last month. Fifty-two percent now say they oppose the effort, compared with 46 percent in February. The poll of 504 registered voters was conducted March 16-18 and has a margin of error of plus or minus 4.9 percentage points, according to WBUR. Boston 2024 is a private nonprofit funded by donations and receives no public money. But the bid committee’s arrangement with the former governor became a public issue this month, after the committee confirmed that Patrick would take a consulting role, but did not immediately announce his compensation. Walsh addressed the governor’s fee during an interview on Boston Herald Radio on Thursday morning. The mayor said he appreciates that former governor Mitt Romney supports the bid, and said he hoped two other former governors, Michael Dukakis and William F. Weld, will also serve as volunteer ambassadors. Patrick did not reveal Thursday what his new position will be; a Boston 2024 spokesman said the job is not with the committee. Boston 2024 retains several connections to Patrick’s administration, most notably Rich Davey, the committee’s chief executive, who was Patrick’s transportation secretary. The US Olympic Committee in January chose Boston to represent the nation in a worldwide competition for the 2024 Games. Rome, Paris, and Hamburg could also make bids. The United States has not hosted the Summer Games since 1996, in Atlanta.